How about that… two guest posts in two weeks. Does that mean I’m getting lazy? Probably not. When it comes to social media, I’ve always been lazy. 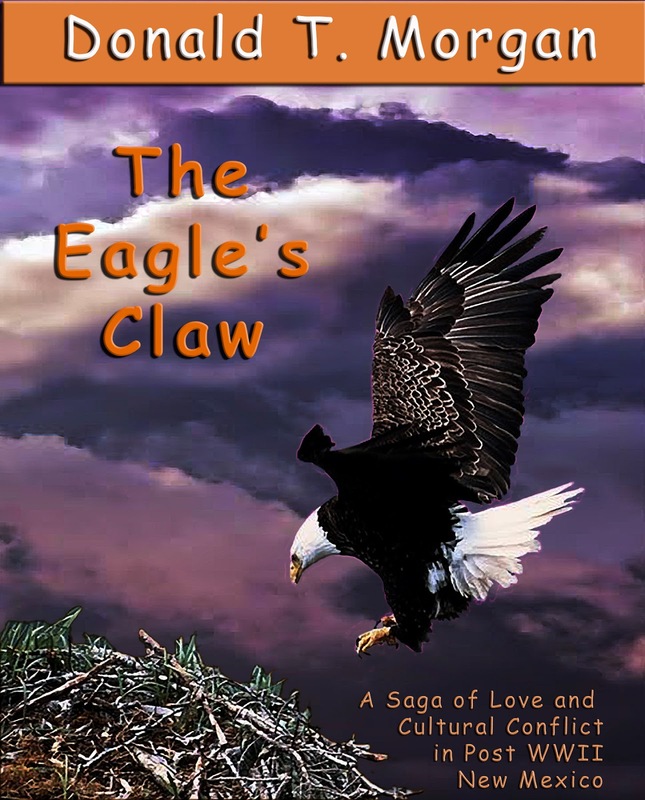 At any rate, I asked another Albuquerque writer with Oklahoma roots to give us a little more of his New Mexico family saga, THE EAGLE’S CLAW, this week, and he complied with Chapter 2 of the book. In prior posts, the last one on December 7, 2015, Donald introduced us to Román Otero (who comes to be called Ro) and his grandmother, known as Cane-Woman. I continue to consider the old woman spooky, but her contemporaries are likely closer to the mark when they label her a witch. 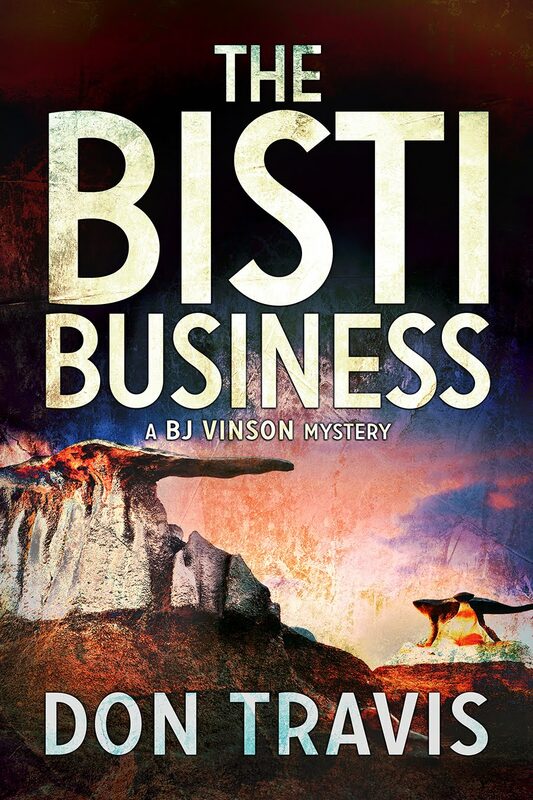 Chapter 2 introduces the other side of the equation, the Chandlers, a white family that owns a large ranch abutting the Edge of Mountain Apache Reservation where Ro and Cane-Woman live. I recognize the post is longer than usual, but please see it to the end. La Ciudad de Terreon sprawled across its tight little valley like age rings on a pine stump. Rows of project homes spilled into older residential sections crammed with ill-fitting commercial zones. In turn, these crowded down on the narrow old-world streets of the original settlement. Jim Chandler’s army surplus Jeep motored past the adobe church on the plaza and turned north on NM35. Once across the Rio Chacon—a tenuous trickle still known to the area’s indigenous people as Wandering Water—he left the town behind and soon breeched Snowflake Pass where the Chacon Range met the Capucha Spur. Almost immediately, the highway entered the Edge of Mountain Apache Reservation and unraveled down the far side of the slope into a violence-ridden fissure known as the Canyon of Winds. The road straightened upon emerging from the gorge and dropped rapidly toward the desert where the rush of air turned hot. Jim bore right at the beginning of a long curve five miles short of his J-Bar-C Ranch. He forsook pavement for the sandy hardpan to play tag with a thick column of dust raised by his spinning tires as the Jeep bounced forward over treacherous dunes to short-cut the road by half a mile. He regained the asphalt and raced north until a red-tiled, two story house came into view. He turned east on a gravel drive and eased in beside a black Lincoln. Tall and heavy-framed, he was in his mid-thirties. He would one day likely tend to flesh, but hard work kept him at a trim two-ten. 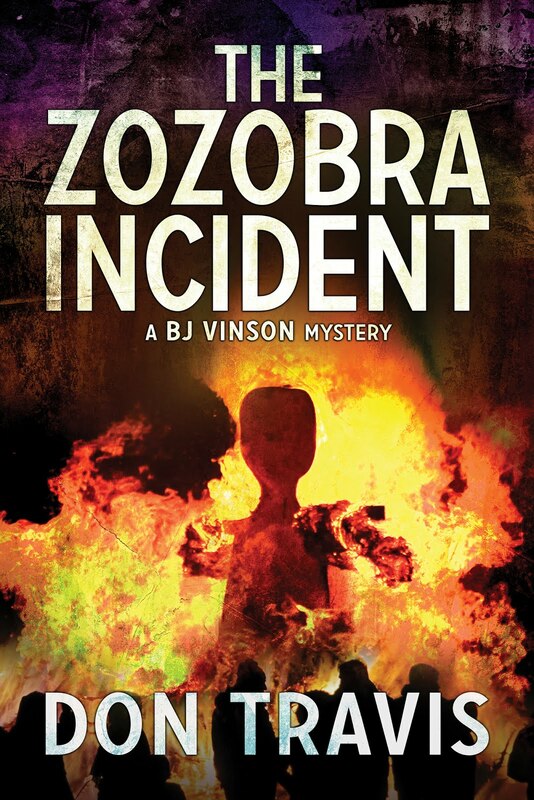 He got out of the Jeep and eyed the tires on the sedan as his wife stepped from the wide veranda. He was going to have to try to find some new ones. They were still hard to come by since the war. “What took so long?” she asked. Paul was something of an enigma to his father. His need for people seemed insatiable, yet he often wandered off alone. Giving in to his wife’s sense of urgency, Jim headed for the bunkhouse and gave instructions to his foreman, Chuck Griggs, to saddle Chigger and turn out the hands for a search. As Jim entered the house for supplies, an unusually restrained Teresa met him at the door. He lifted his daughter and planted a kiss on her tanned cheek. “Where’s Paul, Daddy?” Her eight-year-old voice lacked its customary fire. That brought a half-hearted giggle. She delighted in getting her brother into trouble. Jim was rummaging the hall closet for his sheepskin and a jacket for Paul when he heard Judith calling. As he stepped out onto the veranda, the house was in deep shadow, although an invisible sun still touched the mountains. The earth cooled beneath an evening breeze. He stared into the fading light at a horseman plodding slowly up the gravel driveway. It wasn’t Paul. The pony was a paint. Pedro was black. Eventually, the horse shuddered to a halt beside the veranda. Rider and mount made a scraggly pair. It was difficult to tell which was scrawnier, the flop-eared mare or the youngster on her bare back. The boy stared mutely, a lot of white showing around his pupils. “Uh…does a blond-headed kid live here?” The rider fixed his gaze squarely on Jim’s boots. The mare lowered her head and began cropping grass. When Chuck rode up leading Jim’s stallion, the rancher said some reassuring words to Judith and a wide-eyed Teresa before climbing into the saddle. He led the way past the corral toward a gate between the ranch and the reservation that would save them an hour and a half of riding. The remaining daylight evaporated before they reached it. Once they passed onto the Edge of Mountain Reservation, Jim’s heartbeat picked up the rhythm of Chigger’s hooves until the strange calm that had settled over him wore thin. Then his pulse raced, making progress seem desperately slow. He rode with his shoulders tensed. His legs clutched the saddle. More to break the silence than anything else, he asked the youngster’s name. He repeated the name silently—ro-MAHN…o-TAIR-o. The boy had said it wasn’t far, but that meant little. The ponies plodded onward. Jim’s uneasiness became pain. The night wind swept away his patience. 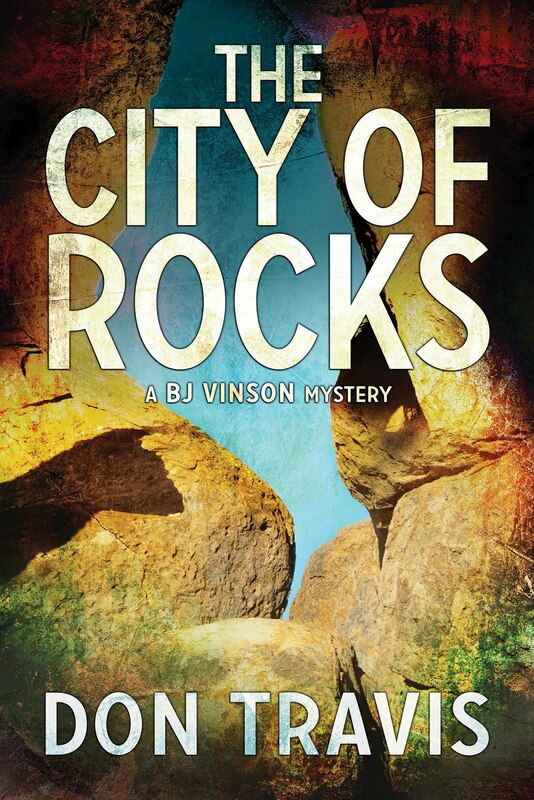 Roman’s thin voice startled him, and he pulled up to see the boy pointing into a deep arroyo. A sliver of moon topped the eastern horizon and cast faint gray images. The black depths of the gully swallowed his flashlight’s beam. The boy raced for the water, passing Chuck cursing his way over the side of the arroyo, laden with ropes and a portable ring of light. A low whinny pulled Jim’s attention down the wash. He motioned, and the foreman went to check the pony. When the canteen arrived, Paul snatched it and upended the container. He took the canteen from his son as Chuck returned and shook his head. “You know what has to be done for the pony,” Jim said. “P…Pedro?” The boy slumped back and nodded. Jim slit the denim of Paul’s right pant leg from cuff to thigh. The break was between the ankle and knee. As he fashioned a splint from boards he’d brought, Paul cried out twice. Román hovered nearby to help where he could. He knelt in the dirt as Chuck held Paul in place while Román lashed the boy’s wrists together in a fireman’s carry: one arm over Jim’s right shoulder, the other under his left arm. Chuck knotted a rope around Jim’s chest and disappeared with the lantern up the side of the arroyo leaving the pit darker than ever. The flashlight punched a feeble hole in the blackness as he handed it to Román. Moments later, Paul’s saddle bumped its way to the top at the end of a second rope. Finally, Chuck yelled that he was ready. The tether tightened, and he began walking up the side of the ditch. Chuck paced him well, pulling steadily, yet giving him time to keep his equilibrium. Paul must have lost consciousness. The boy twisted to one side. His bound wrists pressed against Jim’s windpipe. He stood it as long as possible. “Wait!” he managed to gasp. As he pulled his son higher on his back and drew fresh air into his burning lungs, the earth crumbled beneath his right boot. He cursed as he slammed against a protruding rock. His shoulder went numb. The bones in his neck creaked, but fear for Paul pushed pain from his mind. Román, climbing at his side, grabbed Paul and kept his broken leg from harm. This quick effort threw the lad off balance. He clutched at a long root and seemed to hang in space for a moment before plunging back into the arroyo. “Are you okay?” Jim found new footing. “Okay,” a reedy voice answered from below. He gave the word for Chuck to start hauling him up again. Progress was agonizing. He used his good arm to keep Paul from choking him. The right was only half-alive. Román caught up and stayed alongside until they crawled over the top. Jim rested a moment while a thousand needles danced over his arm as feeling and strength returned to his muscles. After they lifted Paul into Chigger’s saddle, Jim mounted behind him. The rancher peered through the moonlight at the boy beside the stallion. Smooth, deeply shadowed skin, arched brows, and a sensitive mouth drawn into a firm line. Obviously from the reservation. Not a blood though. Too tall. About Paul’s age. Perhaps a little younger. Ten or eleven. The youngster’s eyes stole up to examine him frankly for a second. Sensing revolt, Jim leaned over. I loudly proclaim my love and admiration for New Mexico, and the opening of this chapter paints a great picture of the grandeur and diversity of the state. 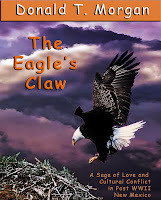 Donald’s novel, THE EAGLE’S CLAW, is self-published as an Amazon Kindle book. I hope this prompted your interest enough to go buy his book. After all, without readers, we aren’t real authors. So keep on reading. Feel free to contact me at dontravis21@gmail.com. Donald can be reached at dtm1332@aol.com.